Having superstars like basketball player Damian Lillard or rapper Snoop Dogg wear your clothing line is something most independent designers only dream of having happen. But for Grand Ronde Tribal member Troy Douglass, it’s a case of perseverance paying off. And the secret to his success? Douglass started a clothing line while he was a student at the University of Hawaii in Hilo. Since then, he has taken the business from selling out of boxes at the school cafeteria and farmers markets to a brick-and-mortar location in the Lloyd Center mall with five part-time employees. Douglass said he saw a need for the business after witnessing different ways Hawaiian youths and young adults showed their culture. With his own mixed heritage, which includes Native American and Pacific Islander, he and his business partner, who is half-Filipino and half-white, decided to call their budding business Cultural Blends. To make his clothing different, Douglass learned how to sew watching YouTube videos and created shirts with silk pockets, which proved to be quite popular among the students at the University of Hawaii. “From there it just grew, and we opened up an online store and started selling there and through Facebook,” he said. After graduating in 2012 with a bachelor’s degree in communications, Douglass decided it was time to return to his Oregon roots. He decided to celebrate that by designing a T-shirt that reads “The Best Coast,” featuring the state license plates of Washington, Oregon and California. 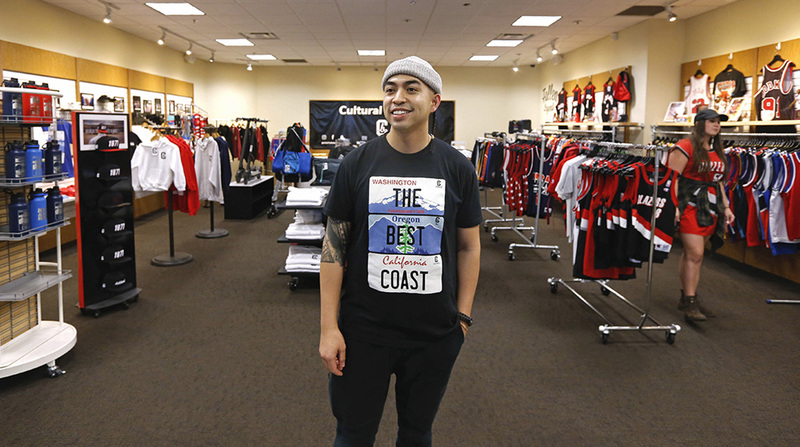 Cultural Blends owner Troy Douglass wears his popular T-shirt design “The Best Coast,” which has been worn by athlete Nate Robinson. The shirt design proved to be a hit and received an even bigger boost when former NBA player and Seattle native Nate Robinson began wearing it. Then, in an attempt to increase sales in the holiday season of 2015, Douglass Photoshopped famed rapper Snoop Dogg wearing one of his shirts and posted it to Instagram, asking followers to like and comment with their favorite Snoop Dogg song. The rapper heard about it and reposted it himself, which turned out to be his most shared photo of the year. Another popular seller is the trucker hat in Portland Trail Blazers colors that said “1977” on it, which is a reference to when the team won its only NBA championship. A friend of Douglass’ stood in line for three hours at a Lillard autograph signing to give him a hat and asked if he’d wear it. As luck would have it, the timing was right and soon after Lillard had a photo on social media of himself wearing the hat after the team won a crucial game in the 2014 playoffs. “We ended up selling 350 hats that day, and he followed me on Twitter,” Douglass said. During the next few years, Douglass continued to evolve his brand and focused on products with multiple elements of different cultures. In November 2018, Lloyd Center began a promotion featuring small, pop-up-style businesses for the holiday season. Cultural Blends proved to be so popular that the mall management asked them to open a store within the mall. Using a grant from Native American Youth and Family Center (NAYA) in Portland, Douglass paid the lease for a storefront. Sales have remained steady after the holidays, even with the traditional dip in retail sales in January and February. His storefront carries the Cultural Blends items, such as shorts, T-shirts, jackets, tank tops, jewelry, hats, coffee cups, air fresheners and water bottles. There are also other local and Native brands, such as Skyn Style. Because it is a large display area, Douglass also features another local business in his store, Fallen Legends, which includes vintage Trail Blazers basketball attire and accessories. Douglass has shared his story of success at NAYA events and hopes to encourage Native youths to pursue their dreams, even if it makes them uncomfortable or they are unsure of how to do it. Douglass thanks the Grand Ronde Tribe for helping him to achieve his goals and get in touch with his Native roots. He’s also taking the Lifeways cultural classes at the Tribe’s Portland office. “The Tribe has helped me every step of the way by paying for college, and now I am getting in touch with my culture,” he said. Danielle Frost is a staff writer with the Smoke Signals newspaper in Grand Ronde. This story is made available through a partnership between Street Roots and Smoke Signals.